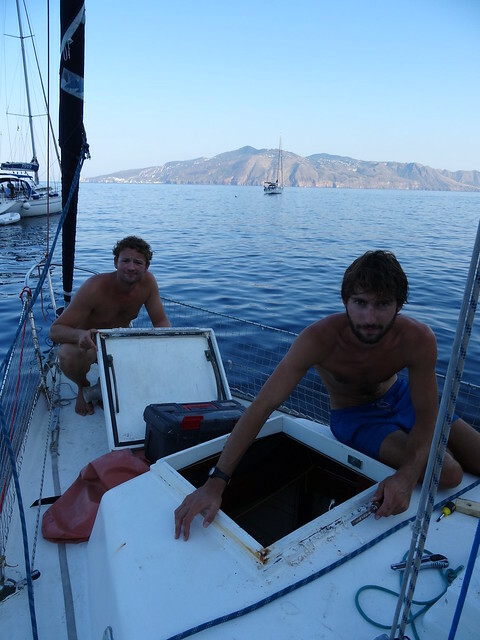 After dropping the other crewmates in Sicilia, we are now three aboard : Adrien, Cassandre and Olivier and our next step is the Island Vulcano. 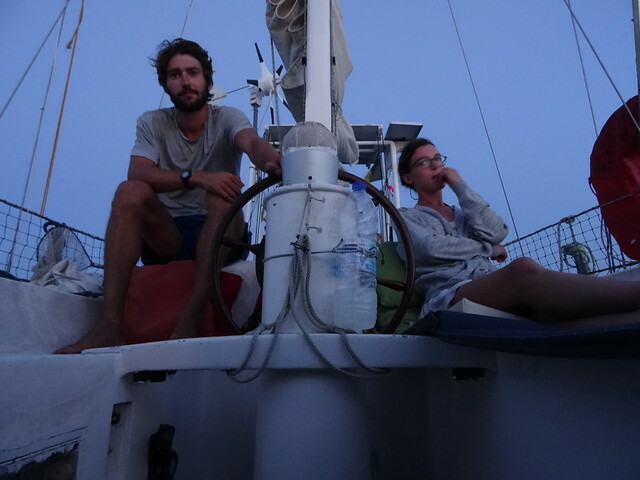 We sail during a few hours in very comfortable conditions towards the island where we discover a strange smell. It comes from the sulfur of the volcano, a smell very similar to rotted eggs. On the island, we can see people in warm mud baths : they are known to be very good for the skin. 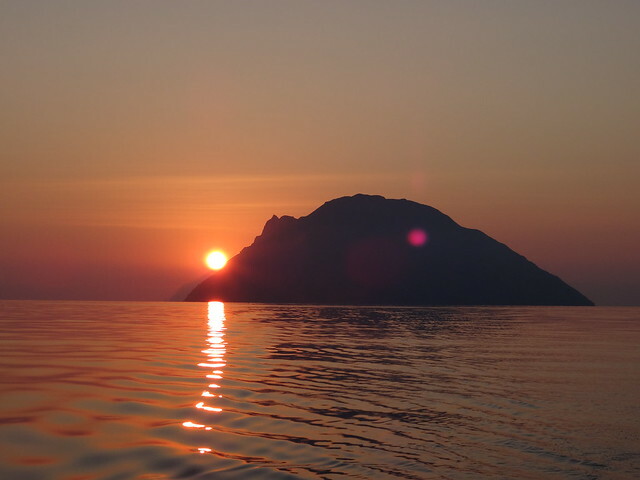 But we won’t take the time to enjoy them and we head to Lipari, the biggest island of the Aeolian islands. There, as always in Italy, the marina costs 70€ for the night. But we don’t want to pay anymore. Weather conditions are cool and we will moor somewhere else. We find a beach with pub, wifi. Luckily, the wifi is on during all the night and we use it to upload photos on the website. The next island we are moving to is Salina. 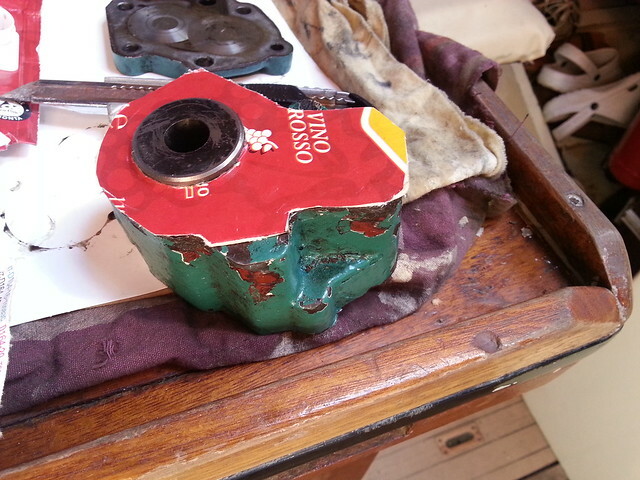 We moor there too and we repair the porthole of the aft cabin which was not waterproof anymore. Next step : Aliduci, the far west island of the Aeolian islands. In the middle of the afternoon, with the engine on , we hear a suspicious noise coming from the engine. We have a look and we realize the alternator is vibrating dangerously. One screw is untied and a cable is disconnected. That explains our doubt on the capacity of the battery since a few days. It does not come from the battery but from the alternator! The hole where the screw goes through is larger than normally, it is not safe to use. We put down the alternator and we continue only with the electricity of the solar panel, which is large enough in Mediterranean Sea. We stay in Aliduci just for the night : we have found a free spot at the fisher dock. The day after, we head in the morning toward Ustica, an island well known for diving, located in the west of the Aeolian islands. We arrive in Ustica at the end of the day and, one more time, we find a free spot but this time on the diving boat’s dock. In the morning, we find the material to repair the alternator. We fulfill the water tank and the gasoline tank and are ready to leave to Sardinia. It is a great crossing with 200 miles and a total lack of wind. It is useless to wait for it : weather forecast says it won’t come for a week and if we wait too much, strong gale force winds are to be expected. So we decide to go now, only with the engine on our side. As you can understand, we are not in our best mood. Hearing the noise of the diesel engine is very boring. Hopefully, we have a lot of books aboard and we will spend a lot of our time to read. The only distraction of the crossing : we see a turtle at 5 meters of the boat. We try to follow it but it dives without letting us the time to take one picture… After two days, we finally see Sardinia. The wind increases while dark clouds cover the sky, we are about to finish the navigation under the rain. Finally, we arrive at the island of Tavolara at midday totally wet. Once the boat well anchored, we leave the boat in order to eat a well merited plate of pasta at the restaurant on the beach. We come back to the boat in the afternoon and we rest for a while, but at 19p.m. the wind come back very roughly : despite the anchor, we are drifting to the beach! Even with the engine we are in difficulty to counter the wind. As we are entering the swimming area, we manage to get back the anchor. 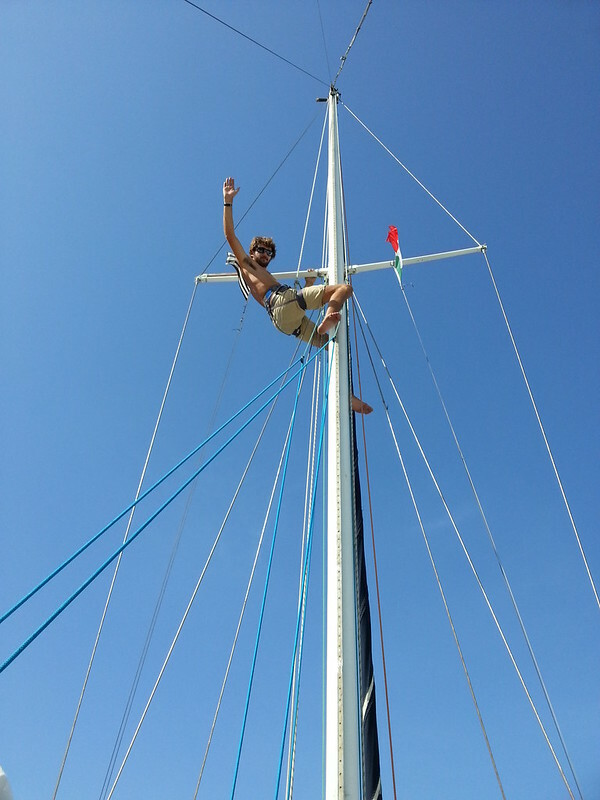 Now we can put a little of the jib sail, that helps us to take more speed and we can sail at 45° to the wind. 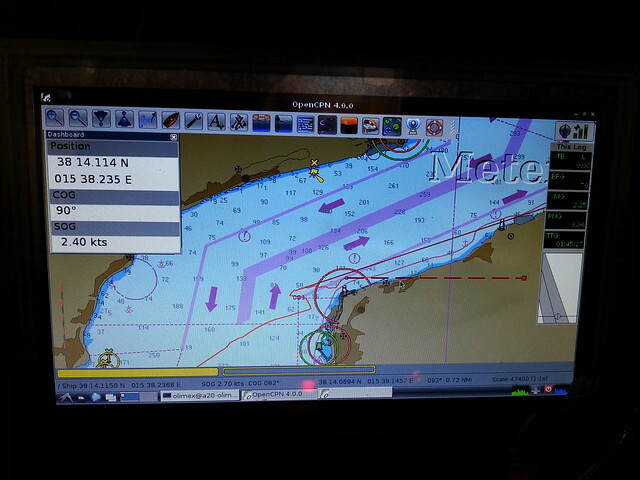 Five minutes later, we are out of danger and heading to Olbia, a very good shelter. There we are happily surprised to find another free dock. 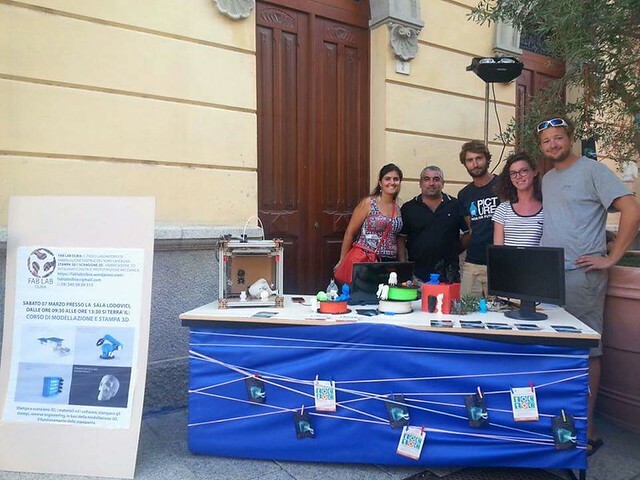 The day after, we meet the fablab of Olbia. They are organizing an event to familiarize children with new technologies such as 3D-printing and laser cutting. Helped by a translator (our italian is not good enough yet), we present our adventure. After the presentation, we invite children to come aboard, they are fifteen running on the deck. Just before arriving in Oblia, we had noticed the engine was one more time difficult to start. 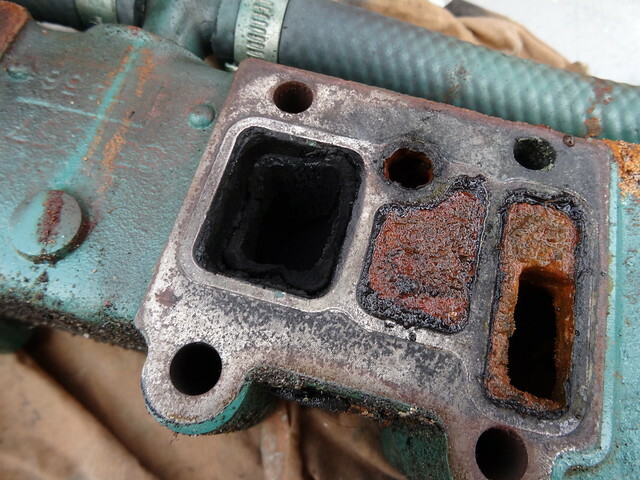 We suspect our engine to be clogged, as in Elbia. We take the exhaust system apart in order to clean it. After that, the engine looks a little easier to start. 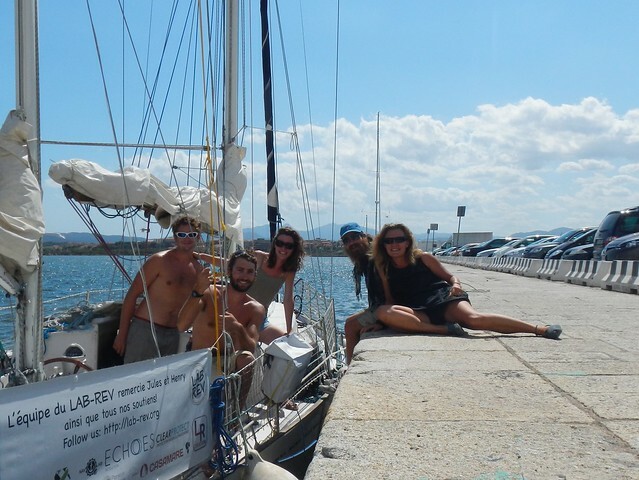 In Olbia we meet Yann and Petra, they have been sailing since three years in the Mediterranean Sea on Nautic of Humble, a boat as long as ours. We spent an excellent evening with them but the next day, we are leaving on our boat while they are leaving on their bikes to a lake in the mountains. 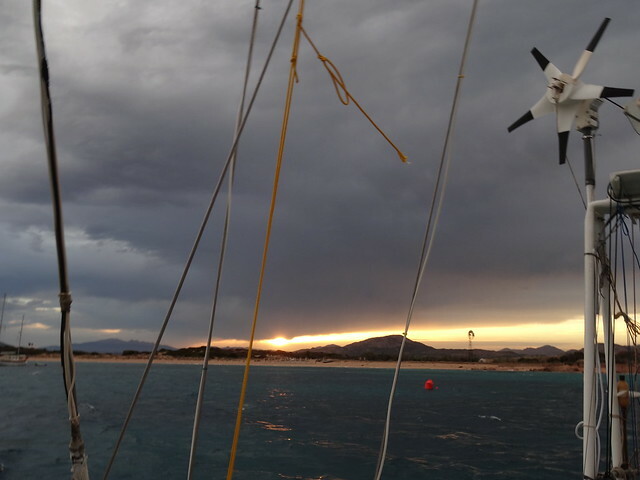 In the evening, we arrive at Capreira, a little island 8 miles from Olbia. 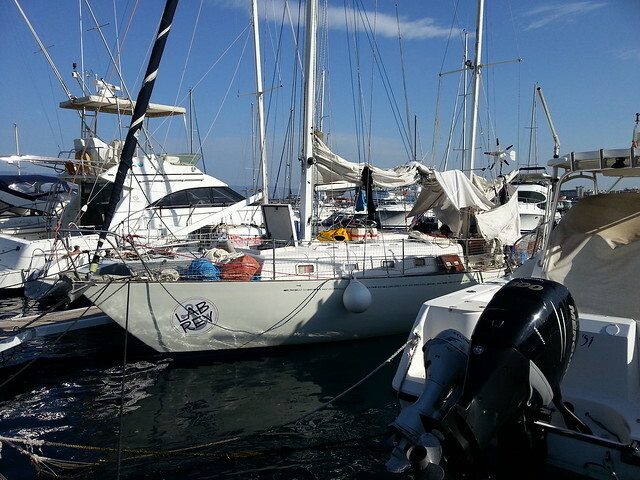 We spent the night here and in the morning, when we start the engine, the oil alarm does not stop beeping. In addition to that, one of our winch does not want to work anymore, he claims for more oil too! There is a lot to be done on the boat, that is why we decided to come back in Oblia, a place where we can find a lot of services. 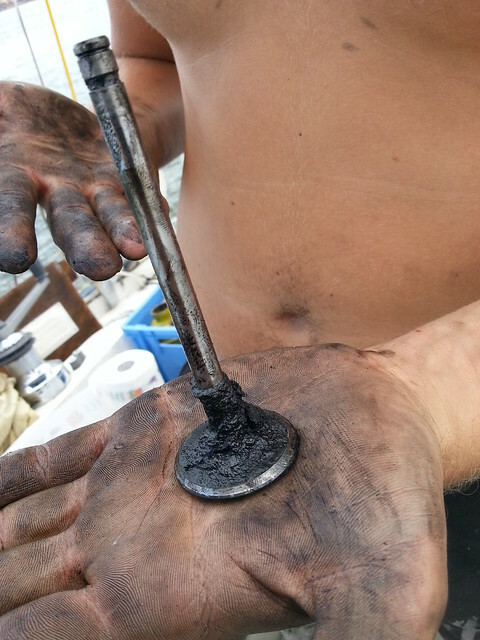 After an engine inspection, we conclude that the lubrification oil is full of dirt and because of that, the oil filter have been clogged. The oil could not pass along properly anymore, so the pressure went down and the alarm beeped. First step : we change all the oil of the motor and we put a new oil filter. 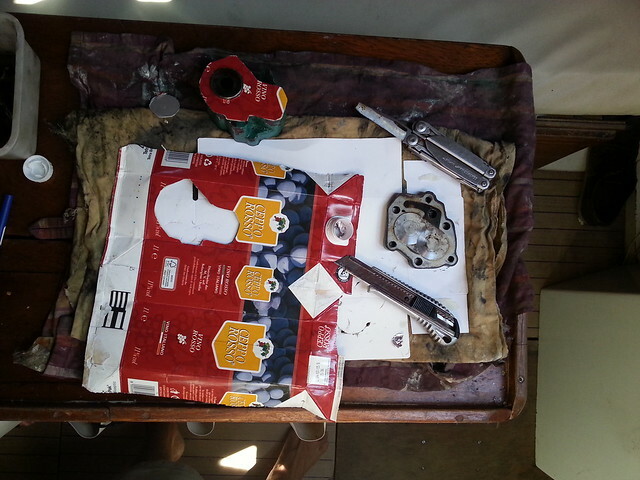 We take this occasion to change the gasket of the oil pump because it was leaking since a few days. But we cannot wait the gasket to be sent here so we use milk bottle. The carton of those bottles is very efficient to realize a basic gasket. The hardest is to cut properly the carton. We are very happy to have discover the problem but there is still a lot to do. We spent all the day to clean different parts of the engine. At 7p.m we finish replacing the second head cylinder, and are ready to start. We are all very tensed when we turn the key…and it starts perfectly! We celebrate it with Yann and Petra, who came back from their bike trip three days ago. We clean one more time the boat which have momentarily been transformed into a garage and are ready to leave. 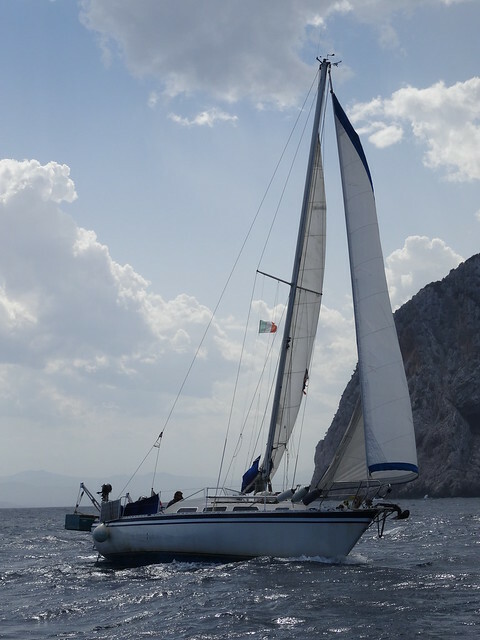 Yann and Petra sail with us to Golfo Pevero, a shelter 20 miles from Olbia. It is very comfortable to sail with another sailing boat. The day after, we move to the Madalena Islands. The wind is against us and is very strong (30 knots), but the water is calm. Yann and Petra are still with us. 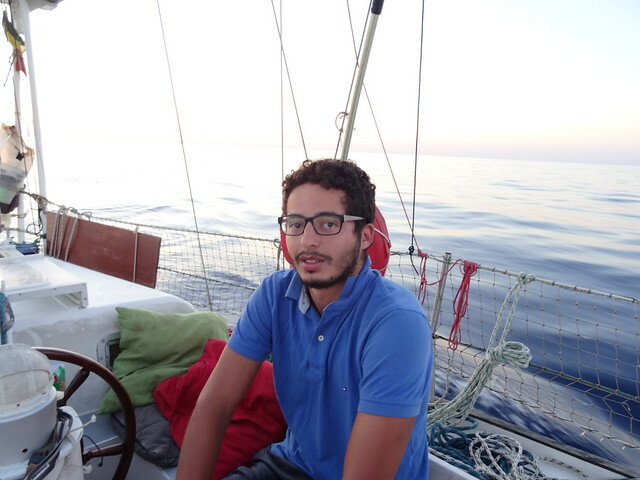 The navigation is not easy, we must slalom among the reefs, the navigation is very similar as in Britany! We finally find a good spot to spend the night. We have left Greece behind us and are now heading to Sicilia. After 4 months on Karukera, this step will be considered as the beginning of the return of the journey. 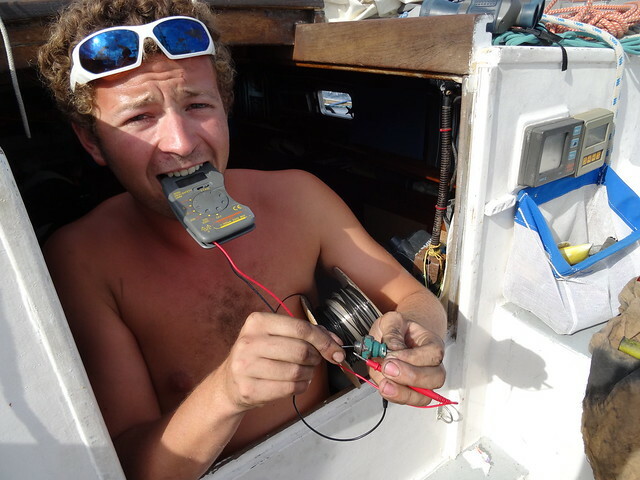 We have already traveled more than 3000 miles (around 6000km) and the boat has suffered. All the problems we had in Greece are not abnormal for a 46 years old boat. Since we left, we knew technical problems will happen and until now we have been able to manage all of them and we are still sailing. Our wind turbine and our water turbine allow us to be autonomous in energy aboard. We haven’t plug the battery to the 220 volts since more than 3 months. And even if our GPS is dead, the navigation system controller still works very well. So we’re coming home. Yahia and Alix will take a plane in Palerme and Cassandre will leave some weeks after. Nobody is expected on the boat after them (for the moment). We won’t visit other countries. All those considerations aren’t good for the moral of the crew. And this is not the weather condition of the crossing to Sicilia or the first stops in Sicilia which will help us to regain it. So without GPS, we are leaving Greece at 6a.m. 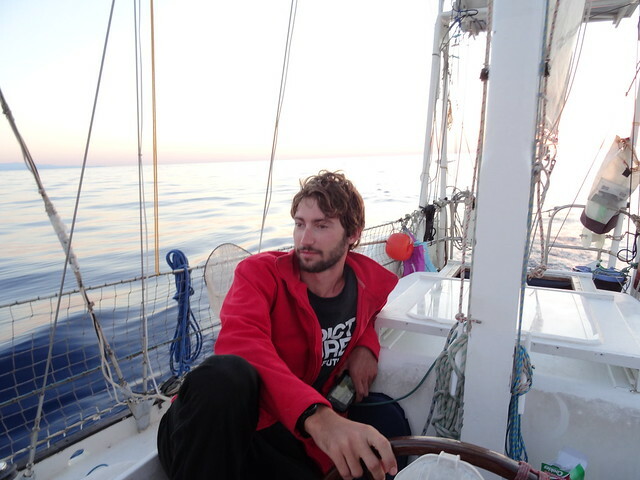 The first day is very hard: rough seas and strong winds (25-30knots), moreover we must sail close to the wind. The short waves are very uncomfortable for the boat and for the crew. 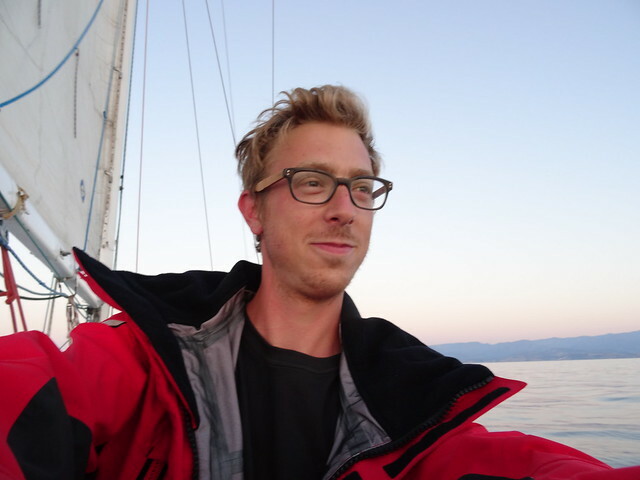 We sail with 3 reefs in the main sail, half of the genoa and no artimon. Because it can always be worse, there are leaks in the aft cabine. The bulkhead which separe the aft cabine from the anchor is not waterproof anymore, beds are wet. Hopefully, the sea becomes calmer and we manage to rest. During the night, as the wind decreases, we put more sails. And in the beginning of the morning, the wind leaves us definitely, we start the engine. It will be on until the end of the crossing… Regarding to the sea, the second day will be more comfortable than the first but the loud sound of the engine is still among us. We are heading to Messina, with the hope of taking a shower. Since the arrival of Alix in Roma, we have taken only 3 real showers. It is ok for one week, but after one month it becomes hard. Once in Messina, the Ormeggiatori announce us the price of the night: 88€! For just one night, and we still have to pay water or electricity! We will negotiate the night at 70€ with free water. We enjoy the showers highly paid. 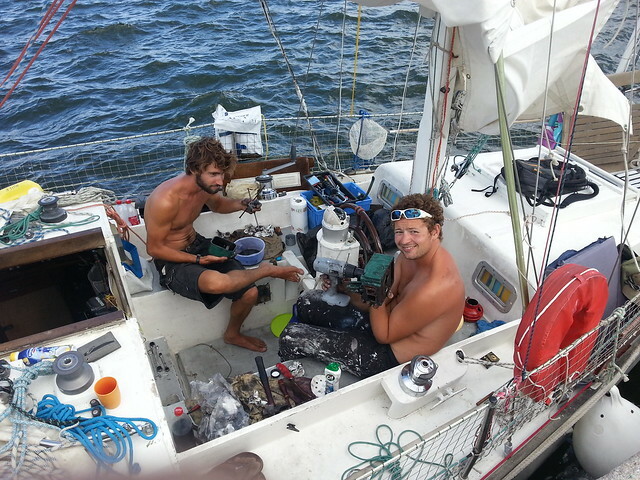 After the strong sailing condition, we double check the rigging. We want to be sure that everything is ok.
During this inspection, we go in the city looking for a new GPS. We find nothing cheaper than 250€, still expensive for us. 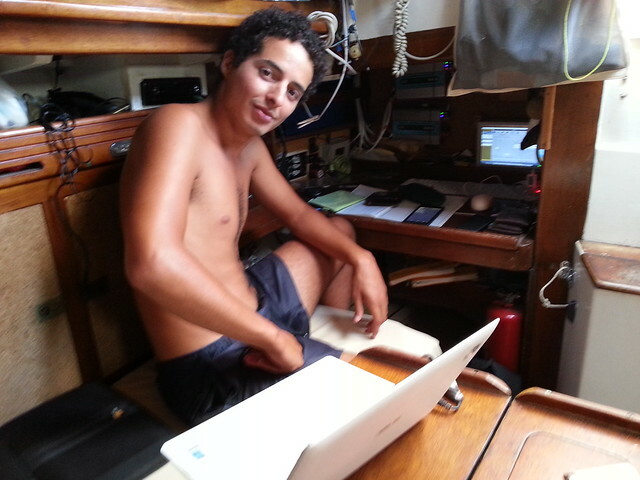 Yahia our computer guy aboard will find a solution by connecting the GPS signal of our smartphone to the navigation system controller via wifi. And it works! It could not be cheaper. For those who want a cheap and complete navigation system controller, take your smartphone and do the same! Now we are heading to Scylla, a small fishing harbour at the beginning of the Messina strait. We went there two weeks ago and we found a place where it was free. Unfortunately, the place is not available anymore. We will put the anchor in front of the beach. 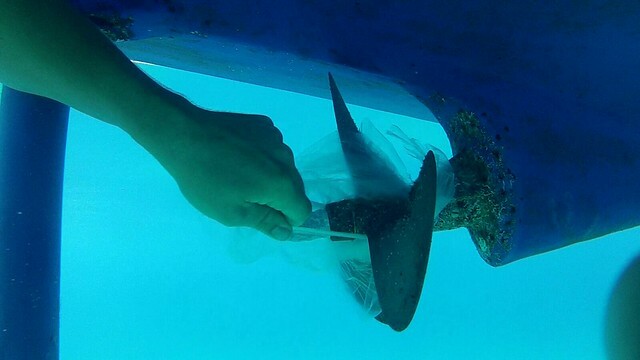 But there is a lot of plastic bag in the sea and one of them go in the propeller. We dive to put it out and we sail to Milazzo. Alix and Yahia will leave from there. But a loud sound breaks the calm of the day. 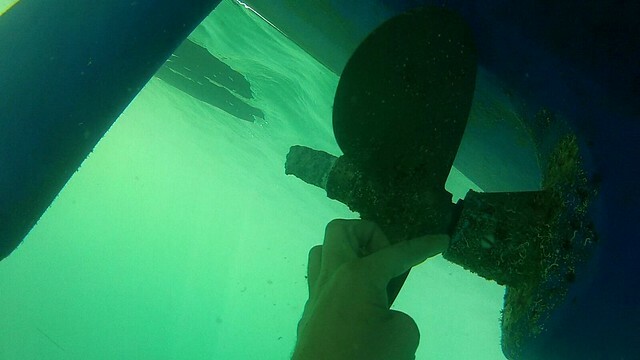 Plastic is blocked in the autolube ring, (a ring near the propeller which maintain it in a good position). After removing the last pieces of plastic, we observe that it has moved a little bit. That is not very good but we test the engine after that and the problem seems to have disappear. We will need to check it offently. Once in Milazzo, we have the same « price problem » than in Messina. The first marina located in an industrial harbour demands 88€. No possibility to deal with the guy, then we leave. The following marina is more comfortable and closer to accomoditons but the Ormeggiatori asks us 120€ for the night! We will negociate the price at 70€ and, even if it’s still too expensive, we will stay for the night. The day after, Yahia et Alix take their train to Palerme. We are three on the boat and heading to Vulcano.